Lagos State is Nigeria's financial center. Over the last few years, its residents have worked in conjunction with their governor to improve many things about the State. Many roads are also being improved and areas like Oshodi, which were previously congested and unmanageable are now unrecognizable. Street lights that previously failed to work are functional, trees have been planted for beautification and CCTV security cameras are up and running to increase security with more cameras on the way. Despite these and many of the other accomplishments, there remain roads in the State that present a safety and healthy hazard for nearby residents and those forced to us those thoroughfares. The Apapa/Oshodi Expressway is one such example. However, although this road is located in Lagos State, it is a federal highway meant to be maintained by the federal government. 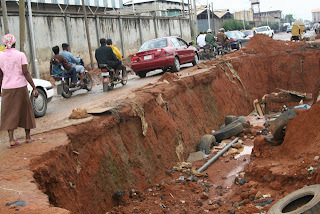 A look at recent pictures of the road indicate that the federal government is yet to repair that road. During a recent visit to Happy Lagosian's blog, I got to see this series of pictures. Now, this road is apparently located somewhere in Lagos State. 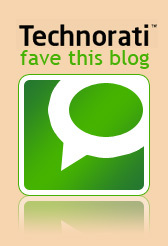 Unfortunately, the blog administrator did not indicate exactly where. As such, it is not clear whether the responsibility for this road falls on the state government or the federal government. Nevertheless, what is clear is that this road is a clear safety hazard to nearby residents who have to walk on that 'road' and drivers who must use it to get from one point to another. Those disposed tires present a fire and environmental hazard, as well. Essentially, this is unacceptable. Lagos State has done well to begin the changes necessary to increase order and security. This dangerous piece of road must become a priority for the sake of Lagosians. If you are concerned about the condition of this road, you can contact Governor Fashola directly at http://www.tundefashola.com/contact/index.html.The Governor's office numbers are 01-765-6414, 01-763-6322 and 01-7636323. The Lagos State Traffic Management Authority can be reached at 01-658-4715. The country code is (234-). As to contact information for the relevant Federal ministries, the website for the Ministry of Transportation is apparently "unavailable" (but if someone can find another link for this ministry, please let me know). The website for the Ministry of Works, which is in charge of managing federal infrastructure and roads, also eludes me at this moment. So, concerned individuals will have to contact Lagos State officials. - What Is Crucial For Leadership? the state of our roads. hmmmm, zero maintenance, tropical climate aka unlimited bouts of heavy rains during the rainy season, bad construction, free for all use(from trucks/tractor trailers and bicycles), throw in some selfishness from the people what we then have is what is present in those pics. how did the driver of the black Mercedes think he would be able to drive across that road? Omg I had to laugh when I saw that road. what the hell? Okay, it's not funny. Oh my goodness. Nigeria. Sorry, for some reason that picture tickles me. I'll be back with a sensible comment. With roads like, it is a nobrainer, the fact that we have one of the lowest life expectancies in the world....Just imagine being new to this area, tired after a long day and driving on this road at night with the street lights off as usual...Unfortunately this particular scene is not strange in Nigeria. But I have to commend the governor of Lagos State...I read the happy lagosian blog and it makes me smile to see the effort he(the governor) is making. Thanks for the contact info. Are you serious?? I thought I'd see un-levelled roads but this? I've heard a whole lot about all the progress Fashola's making in Lagos, so kudos to him. However, I agree that this is definitely a road which requires an emergency fix. Details of whose jurisdiction the road falls under can be haggled over later, once some temporary fix has been put in place. I fear to think how many people have been in serious accidents as a result of this bit of "non-road"! "If you are concerned about the condition of this road, you can contact Governor Fashola directly at http://www.tundefashola.com/contact/index.html" Of course we are not selling out but shouldn't a state governor use state I.S. resources for communicating issues? Re you serious this is a nigerian ROAD? 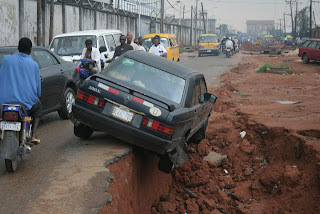 mehn.....i dont think this is suppose to be a road, im sure its some wayside by a dry canal or something..and drivers have decided to drive on the leg path. i just cant believe this......its so bad. Um, guys...this is apparently an OLD picture of the road. That hole`was filled up a long time ago. Somebody, by putting up that picture, is obviously up to some mischief (whether knowingly or not). Oh, and by the way, I AM NOT a government apologist. @ Muse: Thanks for sharing your insight. Can you tell us where this road is? I was having an online conversation with a few folks and each of them are unaware of the roads location. Happy Lagosian has always provided reliable pictures and I hope there was no mistake when he put the pictures up. But, until I have contrary info (at which point I will clarify the post immediately), I have to go with Happy Lagosian. Please come back and share more. Thanks! No problem. This road is the link road between Adeniyi Jones and Ogba - all in Ikeja. That's the best description I can give, not being very conversant with Lagos roads myself. I have seen roads like this in Lagos. Definitely not as bad as this though. This one's a nightmare. Some portions of the Apapa Oshodi freeway are not motorable. I visited the blog, and there are some nice picture of places in Lagos on it. But I wonder though, if we'll see development in Lagos as reaching its pinnacle, when it becomes the metropolis that is completely filled with high rise buildings, malls and all that. Should Tejuosho market be urbanized to extent where it becomes this large shopping centre, with little similarity to the former Tejuosho market that enthralled me with the Fuji music playing, the array of shops selling herbs, young-peoeple clothes, small provision stores. I was surprised there were no pictures of the Apapa-Oshodi Expressway mentioned in the post. Its a shame really but the FG has long lost its sense of shame. The road in the picture was the road linking Ikeja-Ogba-Agege at the beginning stages of reconstruction and I think it was completed about 2Q 2008. I also think the picture 1 was photoshopped. The Benz cannot stand at such an angle; it would have have fallen into the ditch. It is hard believe that such a road exists somewhere in Nigeria, a country so well endowed. Is it that the government officials travel in helicopters? And I was going to say our roads here in the UK were bad after the winter we just had, but then I saw the images in your article and ours don't even compare! I doubt the picture is Photoshopped, who'd waste their time Photoshopping a dusty road. I have no idea how these roads can be fixed. most money sent for the improvements are normally eaten by the politicians. Ya, I thought the roads here in Los Angeles were bad, but they are nothing compared to that. I know that in San Diego there are certain areas that are pretty bad as well.